An unstoppable juggernaut, a golem exists to follow its creator’s orders, and it protects or attacks as that creator demands. Golems are made from humble materials—clay, flesh and bones, iron, or stone—but they possess astonishing power and durability. A golem has no ambitions, needs no sustenance, feels no pain, and knows no remorse. Sculpted from clay, this bulky golem stands head and shoulders taller than most human-sized creatures. It is human shaped, but its proportions are off. Clay golems are often divinely endowed with purpose by priests of great faith. However, clay is a weak vessel for life force. If the golem is damaged, the elemental spirit bound into it can break free. Such a golem runs amok, smashing everything around it until it is destroyed or completely repaired. Aaron Hübrich helped orchestrate the illustrations for the Monster Manual’s full suite of golems, as art director at Conceptopolis. 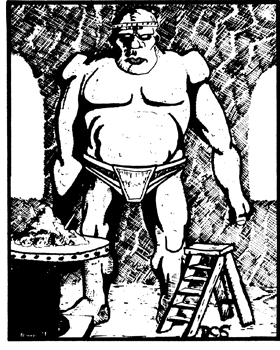 A few types of golems appeared back in the Original Edition’s Supplement I: Greyhawk; however, an error in the book removed their introductory text, so that giant slugs (listed directly before them) appeared to have flesh, stone and iron varieties. As for the actual golems, they appeared based on Frankenstein’s monster, living statues, and Harryhausen’s Talos. 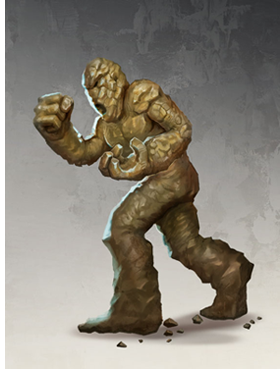 A clay golem can be created by a lawful good cleric of 17th or higher level (unless a magical tome is used, in which case a lower level cleric can create one). It requires a resurrection spell, an animate objects spell, a commune spell, a prayer spell, and a bless spell. The cleric must first fashion a man-shaped clay statue, and once this is sculpted the cleric must go through an uninterrupted ritual using the spells delineated. Materials to do the spell require an outlay of 20,000 gold pieces. Vestments for the ritual cost another 30,000 gold pieces, minimum. In addition to immunity to all but blunt weapons, clay golems were not affected by spells other than move earth, disintegrate, and earthquake. Over the years, there would be a number of different golems crafted—out of stained glass, straw, even children’s toys. In the Monster Manual, we welcome back the original four flesh, clay, stone, and iron! The Monster Manual (releasing September 30) presents a horde of classic Dungeons & Dragons creatures, including dragons, giants, mind flayers, and beholders—a monstrous feast for Dungeon Masters ready to challenge their players and populate their adventures.